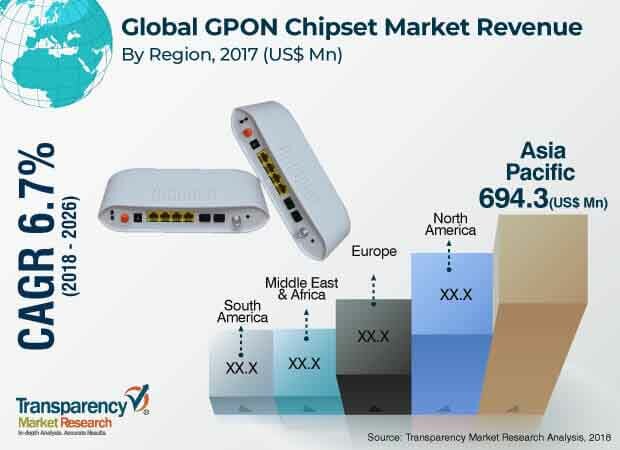 The global GPON chipset market was valued at US$ 1,751.2 Mn in 2017 and is projected to expand at a CAGR of over 6.7% from 2018 to 2026, according to a new report published by Transparency Market Research (TMR) titled ‘GPON Chipset Market – Global Industry Analysis, Size, Share, Growth, Trends, and Forecast, 2018–2026.’ Growth of the market is primarily attributable to advancements in technology and increasing need for secure and reliable network operations. Moreover, high demand for GPON chipsets across industries such as IT & telecom, residential, and hospitals is expected to propel the global GPON chipset market during the forecast period. The global GPON chipset market has been segmented based on technology, equipment, end-use industry, and region. Based on technology, the market has been segregated into 2.5G-GPON, 10G-GPON, XGS-PON and NG-PON2. Based on equipment, the market has been classified into optical line termination (OLT), optical network unit (ONU), and optical distribution network (ODN). Based on end-use industry, the market has been divided into hospitals, residential, IT & telecom, government institutions, and others (including BFSI, transportation, and commercial). Based on geography, the global GPON chipset market has been segmented into North America, Asia Pacific, Europe, Middle East & Africa, and South America. Among end-use industries, the IT & telecom segment is anticipated to constitute a significant market share from 2018 to 2026. The segment is expected to be driven by the rising demand for next-generation GPON chipsets. Increase in penetration of Internet across developing countries coupled with surge in IP traffic worldwide has fueled the market. Growing number of FTTH deployments and rising demand for higher bandwidths are expected to boost the demand for GPON chipsets during the forecast period. Among regions, Asia Pacific is anticipated to hold a leading share of the global market during the forecast period, followed by North America and Europe. This is primarily due to the rising demand for GPON in the Asia Pacific region, especially China. Over the last decade, there has been rapid conversion from wireless to wired optical communication in China. This transition phase is further driving the market in the region and making the country extremely favorable for penetration of GPON chipsets. Furthermore, presence of a large number of manufacturers of GPON chipsets in Asia Pacific has made it a prominent region of the global GPON chipset market. Moreover, growing adoption of gigabit passive optical networks (GPONs) and Ethernet passive optical networks (EPONs) is an increasing trend that the GPON chipset market is likely to witness in the next few years. Moreover, the market in Asia Pacific is projected to expand rapidly between 2018 and 2026, due to ongoing technological innovations in the region. The market in Middle East & Africa is estimated to witness moderate growth from 2018 to 2026. The market in South America is expected to witness sluggish growth during the forecast period. The research study includes profiles of leading companies operating in the global GPON chipset market. Market players have been profiled in terms of attributes such as company overview, financial overview, business strategies, and recent developments. Parameters such as investments in and spending on GPON chipsets and developments by major market players have been tracked. Some of the key players operating in the global GPON chipset market are Adtran, Inc., Alphion Corporation, AT & T Inc., Broadcom Inc., Calix Inc., Cisco Systems, Dasan Zhone Solutions, Fujitsu Ltd., HiSilicon Technologies Co., Ltd., Huawei Technologies Co., Ltd., Marvell Technology Group, Motorola Solutions, NXP Semiconductors, Realtek Semiconductor Corporation, and Zyxel Communications Corp.